Elysium, a MARS Balloon flight is expected to launch at noon (+/- 1 hour) on Sunday, October 26. The 434 MHz USB signal should cover much of the UK and can also be received world-wide online using the SUWS WebSDR. The balloon will be launched from the Mendips (51.254, -2.714) and is expected to travel almost directly east for a landing near Basingstoke. The estimated flight time is 135 minutes with a peak altitude of 30 km. 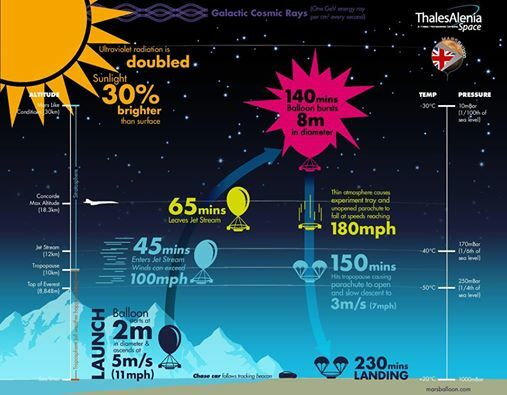 55 science experiments submitted by 36 schools from across the UK will soar 30 km up into the atmosphere and back. The flight will also contain a plane from Bristol SEDS, activated before launch and to be released at peak altitude, with a separate onboard tracker. Expected to fly further east than Basingstoke. Callsign $$UBSEDS3 frequency 434.600 MHz LSB RTTY 50 baud 400 Hz shift ASCII-8 no parity 2 stop bits.